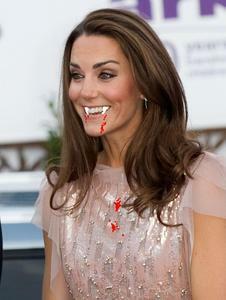 She looks a bit pale and wan ,as if in need of blood and has a longish face with steely eyes and vampiric style hair. 뱀파이어 have to have soil in their coffins if they are away from 집 and Kate had a lot of 나무, 트리 soil in the church; interesting.......! uhmmm, are 당신 friggin nuts? NO WAY. *sarcastic gasp* Obviously. Why didn't we see it before!? Dude, get over yourself. 뱀파이어 aren't real, no matter how much we would like to believe so. Congratulations on mastering Photoshop. 당신 really brought 'Kate-pyre' to life with that vivid and detailed artist rendering. canadian acutally, thank 당신 very much.